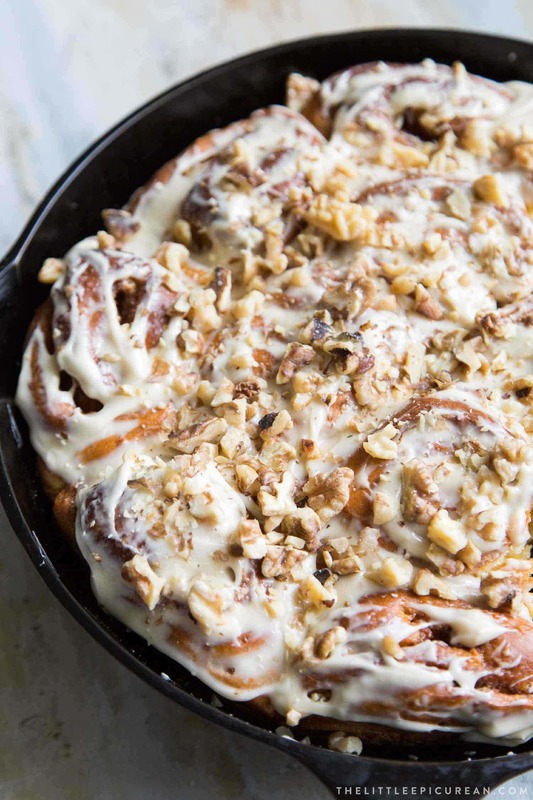 These carrot cake cinnamon rolls are frosted with whipped cream cheese and topped with toasted walnuts. It’s the iconic flavors of carrot cake injected into sweet rolls! Spring has sprung and it’s officially carrot cake season! With Easter less than a week away, now is the time to take advantage of this root vegetable. One can only eat so much carrot cake before the palette craves something new. Rather than make carrot bread or carrot muffins, I opted to infused the flavors of carrot cake into my favorite baked good, the cinnamon roll. With the recent success of this banana bread doughnuts recipe, I have been on the hunt for new ways to blend together classic dishes. These carrot cake cinnamon rolls prove that I’m onto a delicious and worthwhile venture. I foresee more fruit and veggie collaborations. Perhaps carrot cake rice pudding, carrot cake New York style cheesecake, or zucchini bread pretzels?! The possibilities are endless! 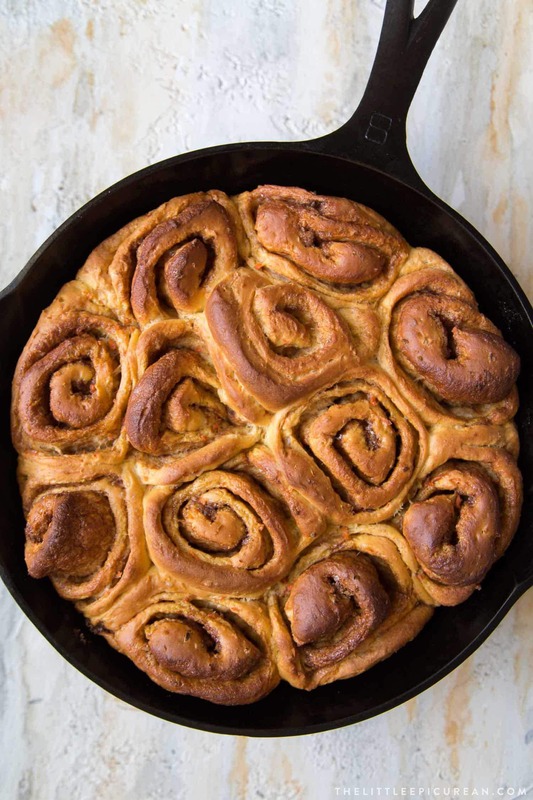 Whether you call them cinnamon rolls, cinnamon buns, or cinnamon scrolls, these swirly baked yeasted breads are a tasty treat that can be enjoyed all year long. Cinnamon rolls are among some of the most versatile baked goods, adapting to all sorts of added flavors. From sweet variations that include dried fruits like raisins (rum raisin cinnamon twisted buns) or a different spices like cardamom (Swedish cardamom buns) to savory applications like baked ham and Swiss rolls, is there anything you CAN’T swirl into a bread roll?! The dough is studded with visible specks of carrots throughout. Use a coarse grater to shred the carrots. For the sake of ease, I highly recommend using the “shredder” attachment on a food processor. I’ve also heard good things about this KitchenAid slicer attachment, however, I have yet to personally use it. This recipe can make 12 large and fluffy cinnamon rolls or 24 smaller sized rolls. The images in this post show the “smaller” version. I used two 9-inch round skillets to bake up 24 smaller cinnamon rolls. 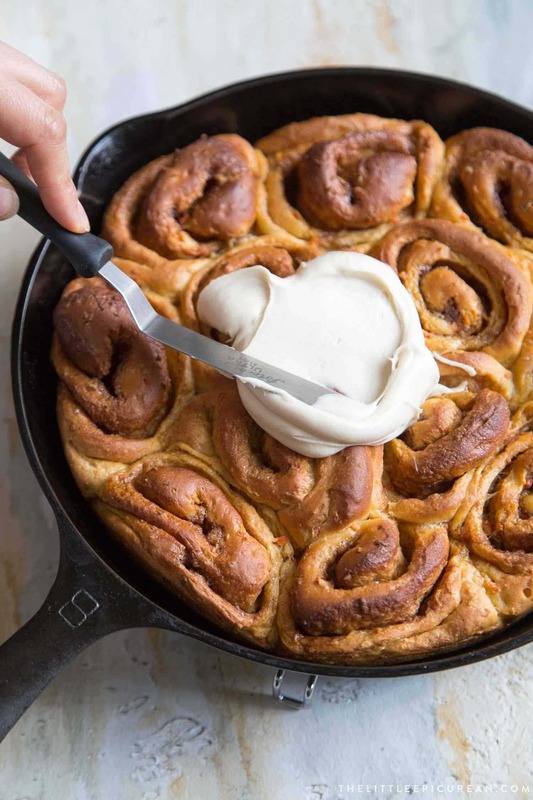 A dozen larger cinnamon rolls can also fit into a 9-inch skillet. The baked rolls will simply rise beyond the lip of the pan. 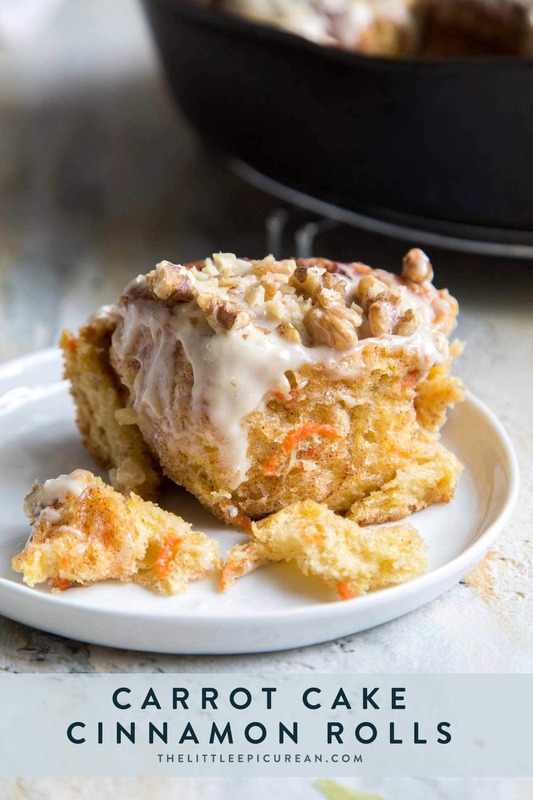 When serving these carrot cake cinnamon rolls as part of a larger buffet of foods, I suggest serving the smaller portions, as to not overwhelm eaters. Obviously, it’s not carrot cake without cream cheese frosting! This frosting is sweetened with powdered sugar and touch of brown sugar. The frosting is rather thin. Cut back on the amount of powdered sugar for a thicker, dense icing. 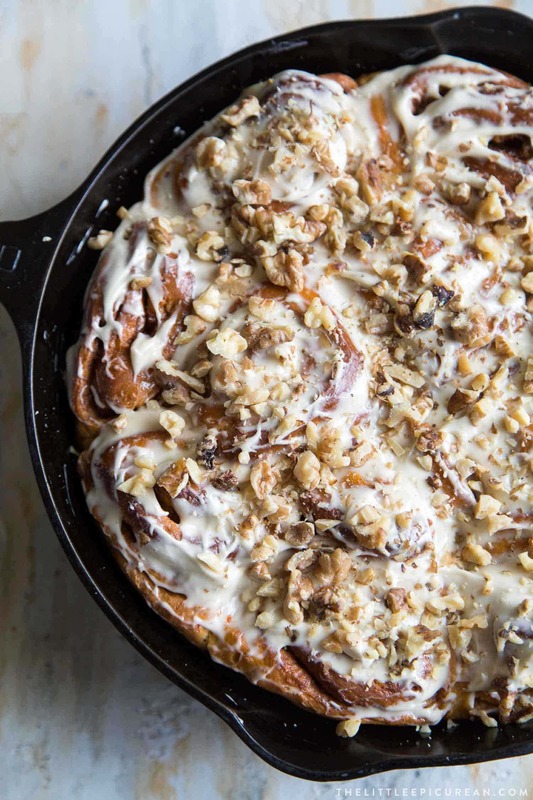 These carrot cake cinnamon rolls are topped with toasted walnuts. Other nuts also work. Chopped almonds or pistachios are great substitutes! In addition, toasted shredded coconuts or chopped macadamia nuts make for a delicious tropical twist! It’s the iconic flavors of carrot cake injected into cinnamon rolls! DOUGH: In the bowl of a stand mixer, sprinkle yeast over warm water. Add teaspoon of sugar and stir to combine. Let sit for 5-7 minutes to allow mixture to bubble and activate. Whisk in remaining sugar, milk, egg, and egg yolk. Attach dough hook to stand mixer. In a large bowl, whisk together flour, salt, and cinnamon. Add 2 cups of flour mixture to stand mixing bowl. Mix on low speed until dough starts to come together. Transfer dough to a lightly greased bowl. Cover with plastic wrap and let dough rest at room temperature for about an hour, until it has doubled in volume. Punch down risen dough. Transfer to a lightly floured work surface. Roll dough into a 20 x 14 inch rectangle. Filling: Spread softened butter over rolled out dough. In a small bowl, whisk together sugar, brown sugar, cinnamon, and salt. Distribute cinnamon sugar filling over buttered dough. Assembly: Starting at the longer end, roll dough into a log. Slice log into 12 equal parts (or 24 equal parts). Place rolls in a greased 9x12-inch baking pan or 9-inch round cast iron skillet. Cover with plastic wrap and let rolls rest for 30-45 minutes at room temperature to allow rolls to rise. Preheat oven to 350 degrees F. Remove plastic wrap. Bake rolls for 30-35 minutes until golden brown on top and the internal temperature of rolls registers at least 185 degrees F. Allow rolls to rest for 5 minutes to cool slightly. Frosting: Beat together cream cheese and butter Add vanilla, powdered sugar, brown sugar, and salt. Beat until smooth. 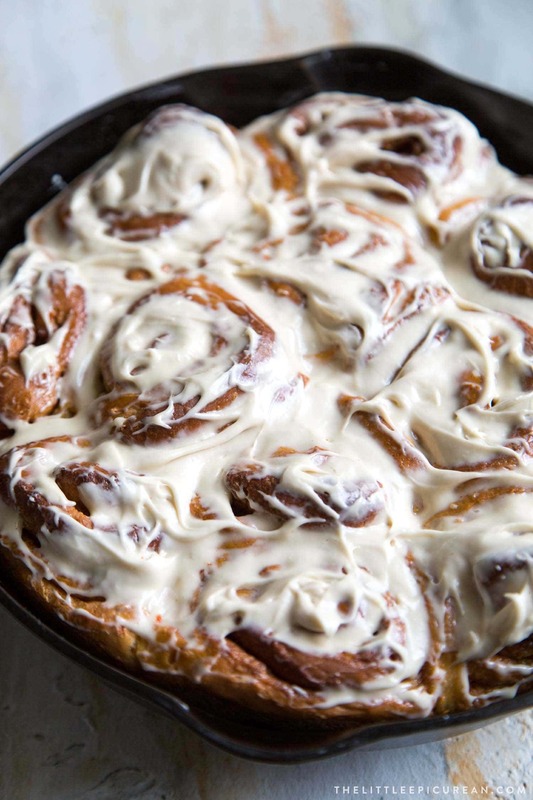 Spread over warm carrot cake cinnamon rolls. Top with toasted walnuts, as desired. Serve cinnamon rolls warm. This recipe can be used to make 12 large cinnamon rolls or 24 smaller cinnamon rolls. 12 cinnamon rolls can be baked in a 9x12-inch baking pan, 9-inch round cast iron skillet (or cake pan), or in an 9-inch square baking pan. Use two pans for 24 rolls. Reduce baking time to 20-25 minutes when baking the smaller cinnamon rolls. *If dough is too sticky during mixing, add additional flour one tablespoon at a time, up to 1/4 cup. REHEATING NOTES: To keep the rolls moist, place a glass of water in the microwave along with the bread roll. Microwave for 30 seconds, or until bread is warm. The glass of water helps prevent the bread from drying out. This is the perfect Easter Brunch! I love the texture from those nuts!